Teachers need to promote an ethos in all classes where children feel able to talk about their lives and feelings, where the class are encouraged to support one another and work collectively. The effects of racism, including anti-semitism, disabilism, sexism, homophobia and prejudice, should be explained and discussed so the children develop empathy, are able to challenge discrimination and include those who may feel excluded, supporting them within and outside the classroom. Young children can be taught this by drawing on their great sense of fairness. Being aware of harassment is essential. It can take many forms, from moving slightly away from a child on the carpet to physical attack. Seemingly minor incidents should be discussed and brought out in the open so the victim is supported and the whole class understands the effects. Understanding that children have different styles of learning and multiple intelligences and need different styles of teaching and learning in our classes. Valuing the teaching of art, music, drama, dance and PE as much as other subjects, and understanding that skill and achievements in these areas, and the consequent self-esteem, lead to greater ability to achieve in all subjects. All members of staff should challenge stereotypical and prejudiced comments used in lessons, the playground and the surrounding environment. For example, challenging name-calling; reporting and clearing offensive graffiti. Using opportunities, through assemblies, to deal with issues of prejudice eg Kick Racism out of Football; understanding why people are disabled or refugees; Jewish Resistance to fascism in the East End; disabled people struggling for their rights. Using opportunities to celebrate the richness and diversity of different cultures eg Black History Month, Refugee Week, Eid (from an anti-racist perspective). being aware that multi-cultural education on its own does not challenge racism; European Disabled People’s Day (3rd December) from a rights, not charity, perspective, International Women’s Day (8th March). Make sure to include white working-class children, eg teaching about the writing, art and struggles for social equality that give dignity to working-class people, so that they do not feel they need to look to extreme right-wing groups to reinforce their identity. Drawing parallels between racism, sexism, disabilism and discriminatory practices, based on social class: to foster solidarity between boys and girls, black and white, disabled and non-disabled, working class students. Challenge the use of normative testing in relation to race, class, gender and disability. Exploring opportunities throughout the curriculum to promote anti-racism and inclusion, eg visits to community organisations, circle time, circles of friends, use of the media, visiting speakers from local minority ethnic communities and disabled people’s organisations. In studying media images, ensure images from different cultures are available (see Bollywood and disability). It is important that all staff fully understand all these issues so that they put them into practice daily in all areas of the curriculum. If teachers feel ill-equipped or uncomfortable to deal with these issues, they should hold staff meetings and seek INSET opportunities. These points were developed for schools by Susie Burrows and Michael Vance of Hackney. Traditionally, in many cultures around the world, people with physical, sensory or mental impairments were thought of as under the spell of witchcraft, possessed by demons, or as penitent sinners, being punished by God for wrong-doing by themselves or their parents. 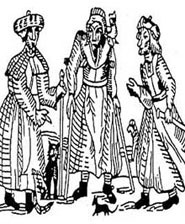 A medieval woodcut of witches. With the Age of Enlightenment in the 18th century, came a more scientific understanding of the causes of impairment and, with it, a sense of confidence in medical science’s ability to cure, or at least rehabilitate, disabled people. Some disabled people (often for social or political reasons) were deemed incurable and placed in long-stay institutions and special schools (or, today, in day-care centres). A notion of ‘normality’ was invested with great pseudo-scientific significance. It was based on assessments of impairments from a deficit point of view against normality: what one cannot do, instead of what one can do. This has been called ‘medical model’ (or ‘individual model’) thinking by the Disabled People’s Movement over the last 30 years. This is not to deny the very necessary role of medical science in keeping many disabled people alive, and reducing their pain and discomfort, but it is to argue that disabled people should not be reduced to just their impairments. The ‘medical model’ sees disabled people as the problem. They need to be adapted to fit into the world as it is. If this isn’t possible, then they should be shut away in a specialised institution or isolated at home, where only their most basic needs are met. The emphasis is on dependence, backed up by the stereotypes of disability that bring out pity, fear and patronising attitudes. Usually, the impairment is focused on, rather than the needs of the person. The power to change disabled people seems to lie with the medical and associated professions, with their talk of cures, normalisation and science. Often, disabled people’s lives are handed over to these professionals. Their decisions affect where disabled people go to school; what support they get; where they live; what benefits they are entitled to; whether they can work; and even, at times, whether they are born at all, or allowed to have children themselves. In addition, the Disability Movement points out how the built environment imposes further limitations on disabled people. Medical model thinking would say these problems are due to the disabled person’s lack of rehabilitation. The Disability Movement perceives the difficulties disabled people experience as the barriers that disable them and curtail their life chances. These difficulties include in school and higher education, in finding work and suitable work environments, accessing leisure and entertainment facilities, using private and public transport, obtaining suitable housing, or in their personal, family and social life. Diagram showing the effects of medical model thinking. Powerful and pervasive medical model views are reinforced in the media, books, films, comics, art and language. Many disabled people internalise negative views of themselves and develop feelings of low self-esteem and underachievement, which reinforce non-disabled people’s assessments of their worth. The medical model, plus the built environment and social attitudes it creates, lead to a cycle of dependency and exclusion which is difficult to break. This thinking predominates in filmmaking, leisure, work and education. In schools, for instance, special educational needs are considered the problem of the individual, who is seen as different, faulty and needing to be assessed and made as ‘normal’ as possible. Increasingly, today, the medical model is being rejected. Many people feel strongly that treating disabled people as needing to be adapted to existing circumstances or, if this is not possible, caring for them in specialised institutions, is wrong. Disabled people rally together to demonstrate for their rights. “Impairment is the loss or limitation of physical, mental or sensory function on a long-term or permanent basis. Impairment and chronic illness exist and sometimes pose real difficulties. Supporters of the disability movement believe that the discrimination against disabled people is socially created and has little to do with their impairments, and that, regardless of the type or severity of their impairments, disabled people are subjected to a common oppression by the non-disabled world. Disabled people are often made to feel it’s their own fault that they are different. If some part, or parts, of your body or mind are limited in their functioning, this is simply an impairment. It doesn’t make you any less human. But most people have not been brought up to accept all people as they are; in other words, to value difference. Through fear, ignorance and prejudice, barriers and discrimination develop which disable some people. These are often reinforced by images in the media. Understanding this process allows disabled people to feel good about themselves and empowers them to fight for their human rights. Diagram showing the problems as perceived by ‘social model’ thinking. The ‘social model’ approach suggests disabled people’s disadvantage is due to a complex form of institutional discrimination, as fundamental to society as sexism, racism or heterosexism. The disability movement believes the ‘cure’ to the problem of disability lies in changing society. Unlike medically-based cures, this is an achievable goal and benefits everyone. The obsession with finding medically-based cures also distracts people from looking at the causes of impairment or disablement. In a worldwide sense, most impairments are created by wars, hunger, lack of clean water, exploitation of labour, lack of safety, and child abuse and these should be addressed more robustly, rather than just responding to the injuries and impairments that result from them. Chart comparing the attitudes of medical model and social model thinking. Social model thinking has important implications for the education system, and particularly primary and secondary schools. Prejudiced attitudes toward disabled people and all minority groups are not innate. They are learned through contact with the prejudice and ignorance of others. Therefore, it is appropriate that the challenge to discrimination against disabled people should begin in schools. The fight for the inclusion of all disabled people, however severe their impairments, in one mainstream social system, will not make sense unless people understand the difference between the social and medical models of disability. The social model has now been adopted by the World Health Organisation. Emotional, mental health and behavioural problems. In the last 30 years, disabled people have campaigned for and won a human rights-based approach to disability. It is beginning to be accepted that disability discrimination, prejudice, negative attitudes and stereotypes are not acceptable. The struggles of disabled people to gain civil rights have led to legislation in the USA (The Americans with Disabilities Act 1990); in the UK (The Disability Discrimination Act 1995); and many other countries, including South Africa, India and Australia. The United Nations adopted the UN Standard Rules on Equalisation in 1992. In all these measures, the onus is on eliminating discrimination by bringing in enforceable civil rights legislation, based on the idea that adjustments need to be made to services, buildings, transport, workplaces, environments, communications and equipment to allow disabled people access. Prejudicial attitudes and practices are outlawed and institutional discrimination, in the form of organisations which exclude disabled people, is being challenged. However, negative attitudes, stereotypes and distorted portrayals of disabled people’s lives still predominate in commercial films. The increasing capacity of the world media system to recycle moving image media means that, despite worthy legislation, negative views are continually reinforced through film. Check out the Disability Rights Commission website for guidance and a Code of Practice. Disability equality training for education professionals is available from Disability Equality in Education Tel: 020 7359 2855.